Ensuring the best protection of palletized loads, regardless of their transport or the conditions in which they are stored is the main objective of Innova. For this reason, we developed INNOVALab, a Test Area in which all kinds of simulations are carried out to improve the conditions of packaging and cargo protection with Stretch Hood technology. INNOVALab allows to simulate the real conditions of cargo handling and storage. The first step is to determine the technical conditions of the best pallet wrapping with Stretch Hood. Secondly, we put these conditions to test with the following simulations: Stability, Movement, Impact and Resistance to water or other external factors. The handling of the load is simulated, performing a static test of inclination of the load to ensure the clamping of the Stretch Hood packaging. One of the circumstances that can damage the product are the impacts or unexpected blows. For this reason, the reaction of the palletized goods are checked against possible blows or sudden movements. Here we analyze the behavior of the pallet during transport. The different inertias to which the palletized load can be subjected are simulated. Finally, a waterproof test is carried out on the protection of the palletized load to check the waterproofing of the film against rain and other external factors. 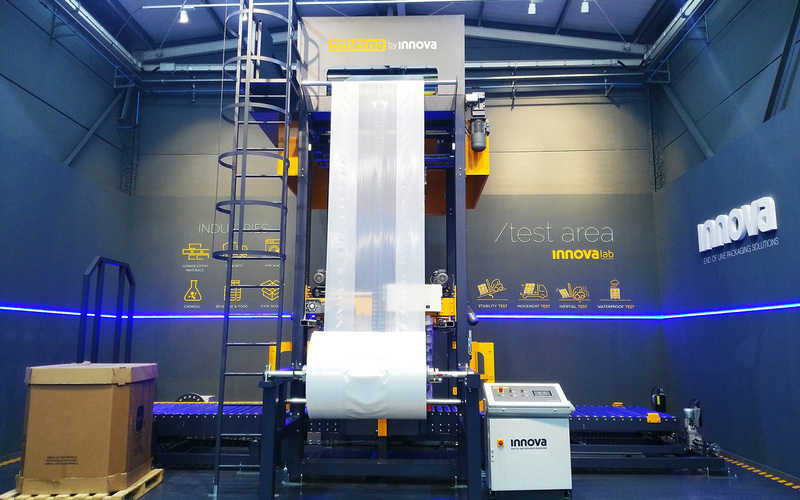 The INNOVALab tests allow to adapt the packaging to the needs of each of our customers. Therefore, Innova can offer much more customized solutions, with the aim of reducing costs and optimizing their final packaging processes. INNOVALab, is a service offered before the acquisition of the machines, and during the execution of projects. Thanks to INNOVALab, several companies have been able to verify the advantages of the Stretch Hood for their products, in addition to obtaining a solution fully adapted to their packaging needs. Do you want to discover more about INNOVA Lab? Get a quote without compromise.